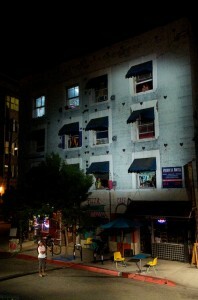 Cornerstone has been based in the downtown Arts District since 1999. 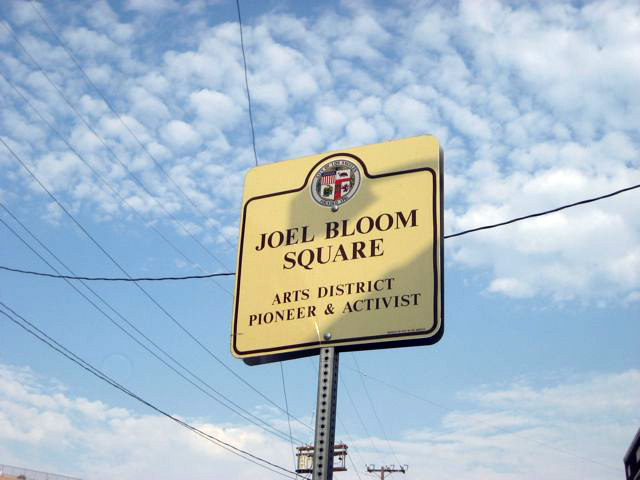 Within a 5-block area of our Traction Avenue neighborhood, you can find ArtShare, Southern California Institute of Architecture, the Japanese Catholic Center, 5 Buddhist temples, eclectic galleries, dining establishments with diverse employees and clientele, longtime “pioneer” loft-dwellers, plenty of newcomers and a number of folks who live on the street. And artists of all kinds! Downtown Los Angeles is thriving, walk-able and very entertaining. atTraction, 2008. Photo by Gary Leonard. Admission is free. No reservations required. For more information about the venue, visit GrandParkLA.org. 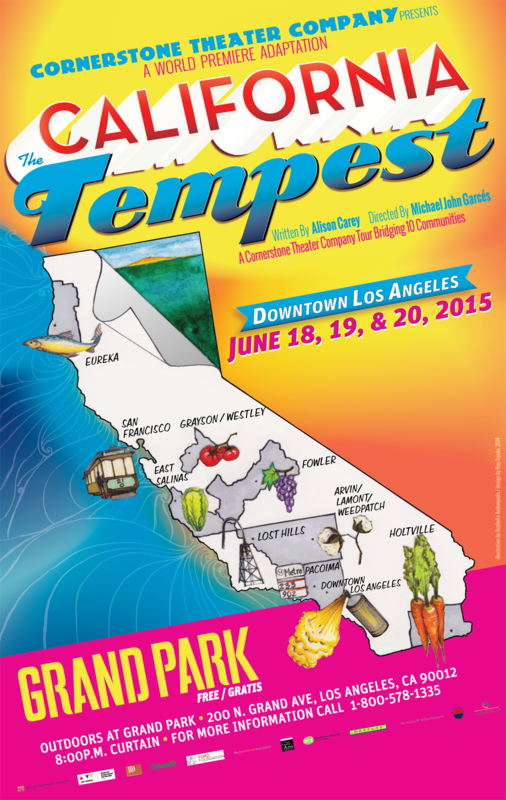 Downtown Los Angeles resident Elzie Alexander, who performed with Cornerstone in a previous production, is now part of the touring cast of California: The Tempest. 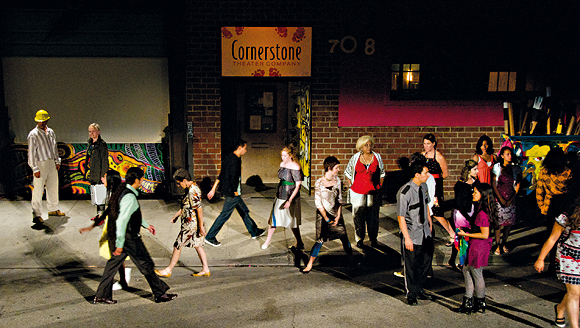 In 2008, Cornerstone collaborated with our own Arts District neighbors to create a new play called atTraction, written by Page Leong. 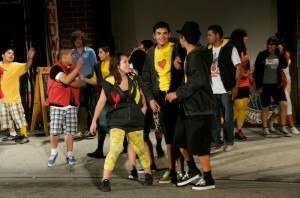 It was directed by Michael John Garcés and included original music by Becky Dale. The stage for this play was the south-side of the 700 block of Traction Avenue. The audience sat on bleachers in the closed-off street while the play unfolded on the sidewalk, in the street, on rooftops and in the windows of the American Hotel. 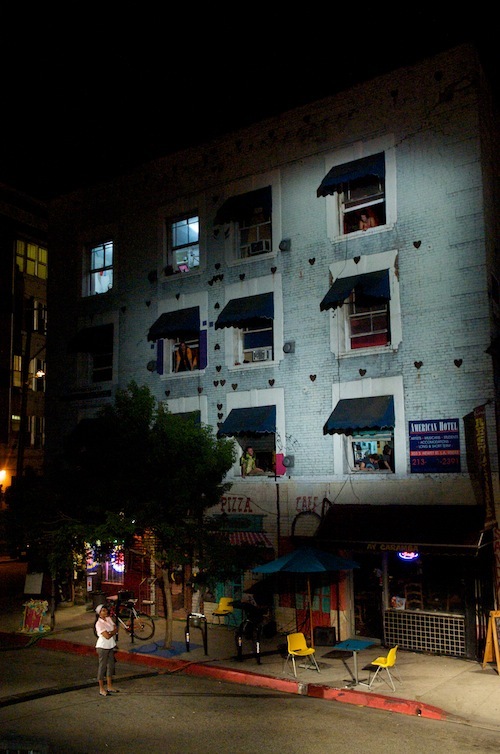 A Rear Window style mystery, the play followed a security guard’s convoluted assumptions and suspicions about all the local folks- artists, church goers, food servers, etc.—and their goings-on, all under the watchful eye of a giant Joel Bloom puppet commenting from Cornerstone’s rooftop. The play had a cast of 70 people—54 of whom were arts district residents—plus four dogs (also local!) and was attended by approximately 620 people.